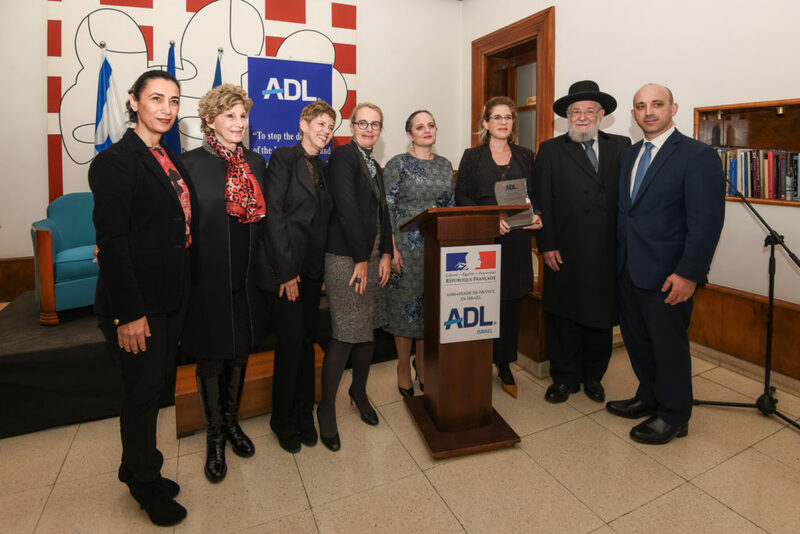 The Anti-Defamation League awarded the first Noah Klieger Anti-Defamation League Medal to perpetuate the memory of the Holocaust to Israel’s former Chief Rabbi Yisrael Meir Lau, and to social entrepreneur and activist Adi Altschuler at an event held on Tuesday evening (January 29th 2019) in cooperation with the French Embassy in Israel. The event was held at the residence of the French Ambassador Hélène Le Gal. The medal is being awarded for the first time in honor of the celebrated Yediot Ahronot journalist Noah Klieger, a native and citizen of France, a survivor of the Auschwitz concentration camp who smuggled children and young people out of France to Switzerland, and was a Chevalier of France’s Légion d’honneur. Klieger, who died recently at the age of 92, dedicated his life to preserving and instilling the memory of the Holocaust and became a symbol all over the world. His personal story is one of loss and renewal, courage and hope. In addition, Klieger played an important role in raising awareness of modern anti-Semitism. The event was attended by members of the Klieger family, ADL Senior Vice President for International Affairs Sharon Nazarian, ADL Israel Director Carol Nuriel and other dignitaries.